Vogue editor Anna Wintour is perhaps the only person in the world who could turn the act of carrying a handbag – any handbag – into an event worth noting. Over the last couple of days, I saw no fewer than three people note on Twitter that Wintour had been seen “with handbag” while partaking in the Wimbledon festivities (where Roger Federer goes, The Bobbed One follows). Not only is that news because Wintour is one of the most powerful people in the entirety of the industry and a public appearance with any kind of recognizable piece is considered a huge coup for a designer, but also because she’s rarely, if ever, spotted carrying a handbag. Just like Wintour’s haircut, Chanel sunglasses and Manolo Blahnik mules haven’t changed in ages, neither has her attitude toward bags – she has people to carry her things, after all. 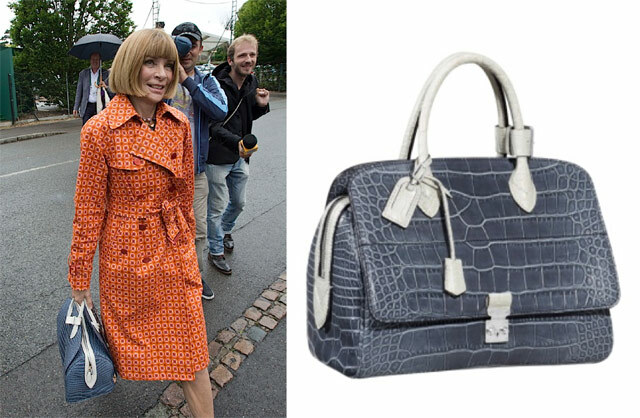 So naturally, when she does deign to carry anything, it’s something absolutely major: the Louis Vuitton Crocodile Old Flap Speedy from Vuitton’s Spring 2012 runway show, which rings up at a staggering $33,000. Not that she paid for it, of course. We’re big fans of this particular bag and all of the beautiful, pale colors it came in; check out more pictures of Wintour carrying it after the jump.